Rahane ended the series with 257 runs at average of 25.70, while Pujara’s tally reads 278 runs at 39.71. 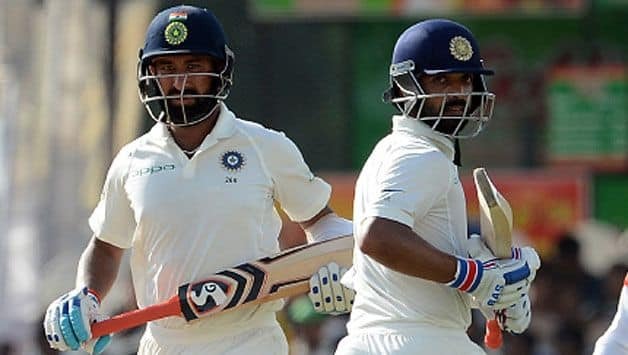 Despite a century and three half-centuries behind them, BCCI Chief selector MSK Prasad feels that Cheteshwar Pujara and Ajinkya Rahane – two of India’s middle order mainstays – could have fared better during India’s five-match Test series against England. As India lost the series by a comprehensive 1-4 margin, one of the major reasons behind their defeats was the inability of the batting to come together. Pujara, scored a valiant century in the fourth Test at Southampton, while Rahane scored a half-century during India’s unsuccessful chase in the second innings. Prior to that, the two batsmen had scored a half-century each in respective innings during the third Test at Trent Bridge which India won. Despite that, Rahane ended the series with 257 runs at average of 25.70, while Pujara’s tally reads 278 runs at 39.71. Prasad, in an interview with the Times of India, pointed out that despite batting not being easy, the two batsmen could have fared better. “Over the last few years, Pujara and Rahane have done well in those No. 3 & No. 5 slots,” Prasad said. “They have enough experience behind them to be the mainstay of our middle order. They did well here too but they could have been a bit more consistent. Prasad pointed out that before India chalk out their plans for the tour of Australia in November, the batting needs to come good. Batting Pujara, Rahane and skipper Virat Kohli, only Hardik Pandya had a fifty-plus score. KL Rahul and Rishabh Pant scored centuries, but they arrived at a time when damage was already done, and series lost. Hanuma Vihari scored a fine fifty on his debut innings but got out for a duck in the second. Throughout the series, batting collapses hurt India more than anything. Following India’s defeat, coach Ravi Shastri stressed on the importance of practice matches ahead of the Australia Tests. Prasad echoed Shastri’s thoughts, adding BCCI is going to assign warm-ups for the tour Down Under. “We are trying to find ways where our Test specialists will be going early and get enough match practise to get acclimatised to conditions,” said Prasad. The former India wicketkeeper also mentioned that the selection is based on many factors, and that a player is only dropped after he has failed to encash on a significant number of chances. Murali Vijay was sent home after the first three Tests, while Shikhar Dhawan, whom India persisted with, was made to play the remaining two Tests. In four matches, the left-hander scored 162 runs at 20.25 without a single half-century. “When we pick the team for an important tour like England, we need to take many factors into consideration, be it experience, combinations, consistency etc. That is how we pick the team,” Prasad pointed out. “After giving enough opportunities, if the players don’t deliver then in all fairness we need to look at youngsters who are doing well on the domestic cricket circuit and for India ‘A’,” referring to the inclusion of Vihari and Prithvi Shaw in the squad. Prasad’s decision of leaving Karnataka batsman Mayank Agarwal out of Indian squad for England ODIs was not received well. He had earlier stated that his chance will come soon, but despite scoring truckloads of runs, Agarwal once again failed to make the cut for the Asia Cup.